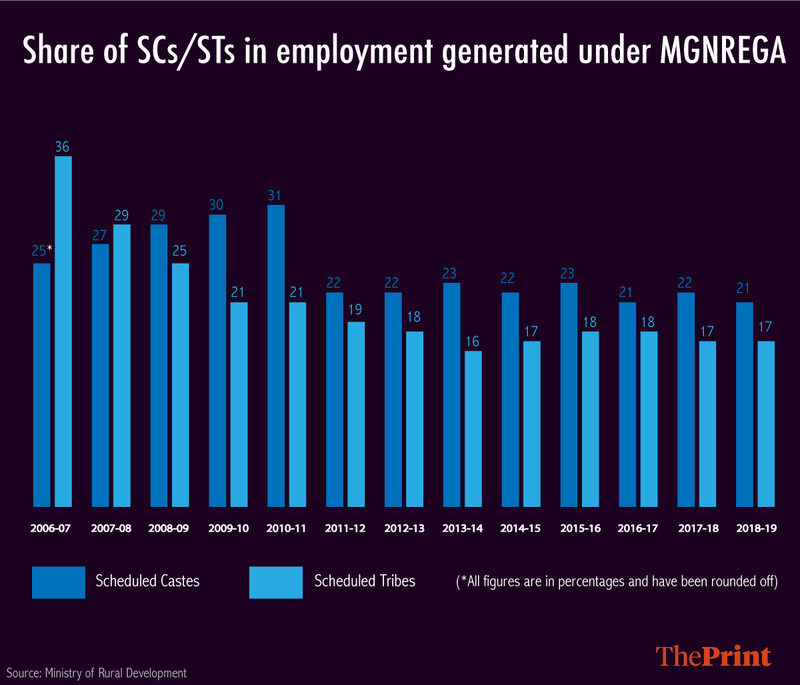 The rural job scheme, launched in February 2006, is intended to cater to poorest and weakest sections, but data shows share of SCs/STs in total jobs has seen a sharp fall. New Delhi: In the 13 years since its launch, the central government’s marquee rural job guarantee scheme has seen a steep decline in the proportion of Scheduled Castes (SCs) getting employment under it, with the figure touching one its lowest points this financial year. The Mahatma Gandhi National Rural Employment Guarantee Act (MGNREGA), rolled out in February 2006, promises 100 days of employment every year to each rural household willing to work. One of the “goals” of the scheme, as laid down by the rural development ministry that oversees it, is the “empowerment of the socially disadvantaged, especially, women, Scheduled Castes (SCs) and Scheduled Tribes (STs), through the processes of a rights-based legislation”. While MGNREGA is intended to cater to the poorest and weakest sections of rural India, a detailed analysis of data available with the ministry reveals a counter-intuitive trend over the years. The share of members of the SC community in the total employment generated under the scheme has seen a sharp fall of 10 percentage points — from a peak of 31 per cent in 2010-11 to around 21 per cent now, shows data. The share of STs, meanwhile, also witnessed a declining trend in the initial few years but has remained in the same range in the last decade. The figures, however, remain higher than the proportion of SCs and STs in the total population of the country — 16.6 per cent and 8.6 per cent, respectively, according to the 2011 census. The Act mandates a third of jobs are given to women and that figure has remained above 50 per cent since 2012-13. MGNREGA data available with the ministry shows the share of SCs in the total employment generated under the scheme in its first year in 2006-07 was 25 per cent. The figure saw a rising trend, going up to 27 per cent in 2007-08, 29 per cent in 2008-09, 30 per cent in 2009-10 and touching its highest of 31 per cent in 2010-11. Since then, however, the percentage of those from the SC community who find jobs under MGNREGA has been going down. The year 2011-12 saw a drastic fall to just 22 per cent from the earlier high of 31 per cent. This figure remained in the range of 22-23 per cent till 2016-17, when it fell further to 21 per cent. In 2017-18, the figure was around 22 per cent but has been at 21 per cent so far this fiscal. For the STs, the participation was the highest in the first year of the scheme’s implementation — 36 per cent. It then fell to 29 per cent the next year and further to 25 per cent in 2008-09, 21 per cent in 2009-10 and 2010-11. In 2013-14, the figure reached its lowest of 16 per cent, before witnessing a rise and has remained a little above 17 per cent since. 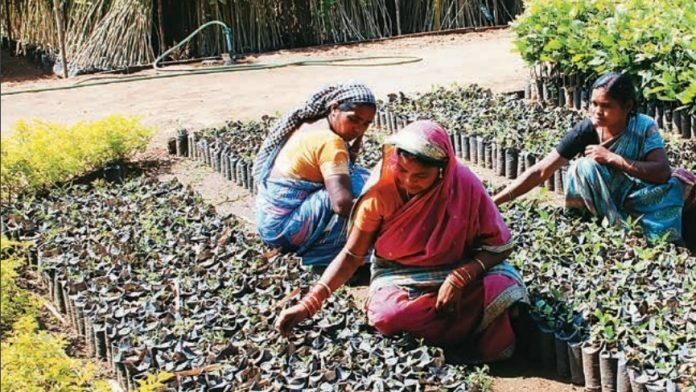 In the fiscal 2009, the SC and ST communities together accounted for nearly 55 per cent of all MGNREGA employment — the highest since the launch of the scheme. One of the reasons the ministry ascribes to the fall in these figures is declining demand, claiming more income generation through sustainable assets created by these communities might be a reason for low MGNREGA work demand. “Through MGNREGA, these groups in 4-5 years created sustainable assets which have led to income generation. Thus, notionally, the demand for work from these households would come down,” said a senior ministry official who did not wish to be identified. “Since the Socio Economic Caste Census data became available, the method of deciding on labour budgets for states has changed as has identification of deprivation. In the last five years, there has been no declining trend in SC, ST participation as such,” said the official. Experts, however, peg the trend to a supply side problem. “This has everything to do with the rationing of demand that has been done. The budget for MGNREGA hasn’t kept pace with the demand for some years now, perhaps ever since 2012-13,” said Yamini Aiyar, president of the Centre for Policy Research. “Thus, even with the ‘largest-ever’ budgetary allocation, funds are never effectively mapped to demand. As a result of this, the scheme has suffered significantly,” said Aiyar. “Moreover, in recent years, MGNREGA has been linked to other schemes like rural housing etc for asset creation and potentially, this might have affected the kind of people getting work under it,” she added.